Told in the style of “The Twelve Days of Christmas,” this joyful poem captures all the excitement of the holiday celebrated with family and friends. Since I had so much fun writing Runaway Dreidel! which uses the rhythm and rhyme of “The Night Before Christmas,” I decided to do it again! 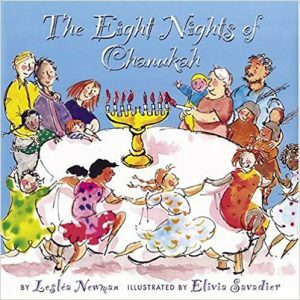 This time I wrote a poem about Chanukah modeled after “The Twelve Days of Christmas.” Try singing it! a present waiting for me. two Maccabees and a present waiting for me.